A reference to Vladimir Vladimirovich KISELYOV (KISELEV), Assistant to St. Petersburg Mayor, Anatoly SOBCHAK. KISELYOV was the right-hand man of Gennady PETROV, one of leaders of the “Malyshevskaya” crime group. He was dealing in racketeering and extortion of money from St. Petersburg businessmen in the interests of SOBCHAK’s mayoral election campaign. 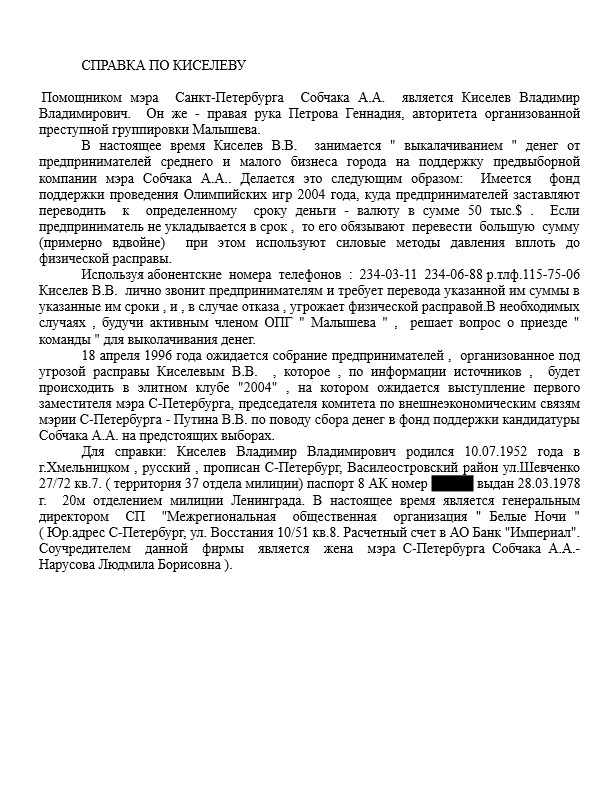 The reference was composed by the public investigator, Oleg Kalinichenko, a member of the group around Andrey Zykov, the former St. Petersburg investigator of especially serious crimes.